"Pip the Beach Cat" is quickly growing as a celebrity in Ocean City. He's gained thousands of followers on Facebook and counting as he continues to travel through the town to different events and landmarks. OCEAN CITY, Md. 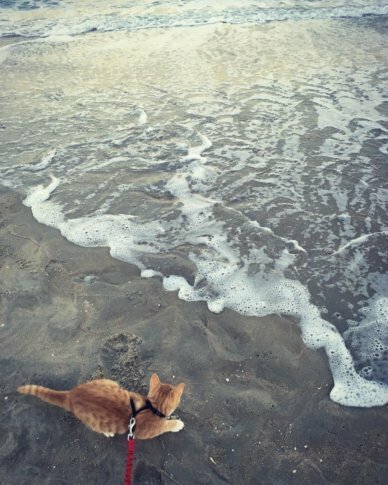 (AP) — A breezy December afternoon doesn’t deter an orange kitten from running around Ocean City. He digs holes in the sand, climbs over dunes and makes his way up to Marty’s Playland arcade on the Boardwalk. He explores the Skee-Ball machines while passersby smile and giggle watching the cat walk up and down the games. This little orange kitten is known as “Pip the Beach Cat” and is quickly growing as a celebrity in Ocean City. He’s gained 3,152 followers on Facebook and counting as he continues to travel through the town to different events and landmarks. The friendly kitten was seen in the Berlin Christmas Parade and out at the Ocean City Police Department, Winter Fest OC and various restaurants. He’s continuing to build his popularity by self-publishing a children’s book and training to work as a therapy cat. “It’s like rediscovering Ocean City through the eyes of a kid, but instead of a kid it’s a cat,” said Emily Meadows, Ocean City resident and Pip’s mother. Meadows said the 7-month-old kitten joined her family after he turned up at a friend’s home. He was homeless, small and dirty looking for a place to stay. Initially Meadows and her husband planned to just babysit him, but plans changed. “He’s just never left,” she said. Meadows and her husband quickly realized that Pip was different from their other cats and needed to run around to get all of his energy out. “He’s super adventurous and tears up our whole house so we have to take him out all the time to keep him busy and give him things to do,” she said. That’s when Pip’s adventures around the resort town began. Pip can be seen on a harness and lease around town with Meadows following quickly behind. She takes the cat to dig around in the sand, walk the Boardwalk and visit various businesses. He’ll chase sea gulls or ride boogie boards and paddle boards. “He’ll stop by and hang out with everybody,” Meadows said. The public’s reaction to Pip has been positive, Meadows said. Sometimes people don’t always notice him and when they do they’re surprised and want to hear his whole story. He’s a joy for families as well as children like to borrow the leash and take Pip for a walk. “Kids love him,” she said. The cat now has his own business cards to give to fans. Pip’s children’s book will be focused on Meadow and her family’s favorite spots in Ocean City. She said they’re currently trying to find an illustrator for the book and believe it will be available for sale by end of April or beginning of May. A portion of the book’s proceeds will be donated to charities including The Cricket Center, Surf Into Integrity and Worcester County Humane Society. Meadows said as Pip attends events, he’ll donate $3 from every book to the organization. The family is also working on making Pip a therapy cat to visit nursing homes. Meadows said the biggest hurdle is typically getting the cat to enjoy car rides, but that’s no issue for Pip. “That’s when we knew he’d be a perfect candidate,” she said. Most therapy cats need to be a year old or older to officially begin to take on the responsibilities and work with nursing home residents. But Pip has done some unofficial visits that have gone well. Meadows is also planning on designing stuffed animal Pips to sell and leave with nursing home residents. She thinks for every Pip that is purchased another will be donated to a homeless shelter or nursing home. Adopting Pip and sharing his adventures with the community has really helped Meadows and people she receives messages from. She said she experiences seasonal depression herself living in a summer resort town, but getting to explore like a tourist again with Pip by her side has helped her fall in love with Ocean City all over again. “Pip has helped me with all of that,” she said. She’s also happy to help over community members who’ve reached out saying Pip has helped their own depression or cope with the loss of a loved one or pet. Meadows hopes her new kitten continues to inspire one social media post or pet at a time. “It means a lot,” she said.